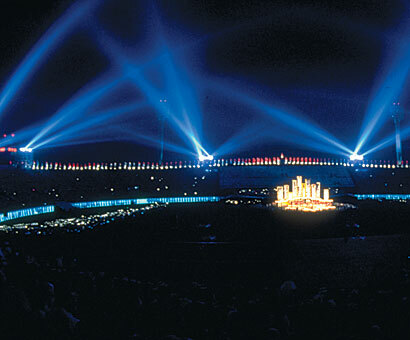 In 1990, the celebration of Singapore's 25th Anniversary of Independence brought together a cast of 25,000 performers in a spectacular afternoon and evening celebration directed by Spectak's Ric Birch in Singapore's National Stadium. The Silver Jubilee production of "One Nation, One People" was devised to celebrate the unity in diversity of this island nation, incorporating performances by Chinese, Indian and Malay groups who all unite under the flag of Singapore. Next morning's Straits Times headline read "Silver Jubilee Gets Gold!" which was a fitting tribute to an Olympic producer and a show that involved so many outstanding performances by Singapore's creative community.